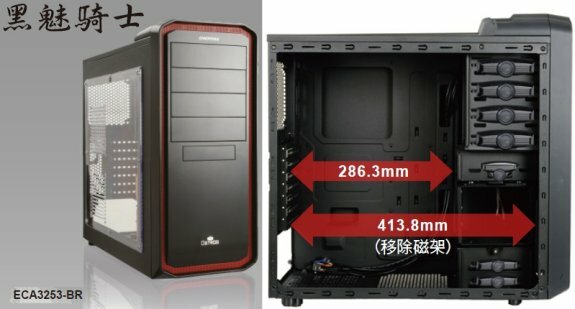 TPU came across photos of the new windowed Enermax Ostrog entry-level mid-tower case. Ostrog is an ATX mid-tower case that's all black (interior and exterior), with a colored frame on its front-panel. It has four exposed 5.25" drive bays, and one exposed 3.5" bay. Including that, there are six 3.5" bays. A set of three 3.5" drive bays is detachable, creating extra headroom (413 mm) for long graphics cards. With the drive cage in place, there's about 286 mm of room for graphics cards. Ventilation includes one rear 120 mm fan, one 120 mm front-intake fan, provisions for one 120 mm bottom-intake fan, two top 120 mm exhaust fans, and two 120 mm side-panel fans. The utility panel has two USB 3.0 ports (standard header), two USB 2.0 ports, apart from front-panel audio jacks.